Recently I was approached by a gentleman who is a well known sailor and collector of boats and anything nautical. He had the inspiration to make a collage out of his collection of old sails and wondered if I could help design a wall hanging. My inspiration was Japanese boro ( above) and I felt this method could be applied to scraps of beautifully textured parchment pieces with fabulous red stitching, layers of rust and copperised rings attached to ancient rigging. 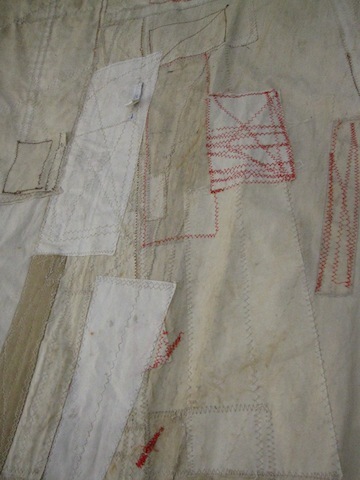 All hand sewn by a master sail maker and voila we had a fabulous textile to hang on his wonderous penthouse wall. A great experience made all the more enjoyable by working with a client who has such a passion for the beauty of objects weathered by the sea. I just discovered your work via Inside Out and love this piece! What a great reinterpretation of the Boro technique. This is so beautiful in it's simplicity and stitching detail! Are old sails hard to acquire? I have been thinking of making a really aged looking pirate flag for my boys and I would love to use ex-sails. Please let me know if you sell/have a contact for me where I could purchase some. Keep up the blogging, I love your work!